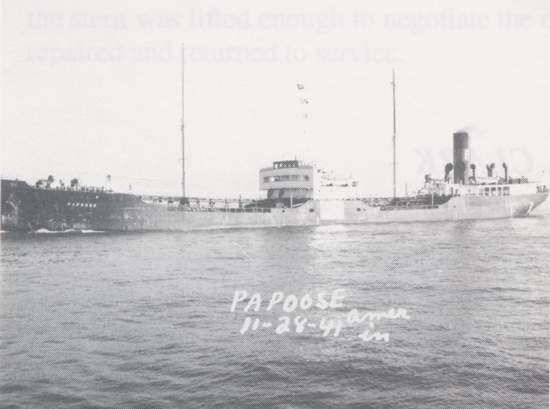 After delivering a load of fuel oil to New England, on her return voyage, the unescorted S.S. Papoose was fired upon by the U-124 in the shallow waters off Cape Lookout. On March 19, 1942 the Papoose was traveling south bound as the U-124 focused her sights on the slow moving tanker, the first torpedo struck her port side and causing the engine room to flood almost immediately stopped the ships engines. The crew quickly abandoned ship, within 10 minutes the second torpedo was fired and struck the Papoose on her starboard amidship, the direct hit exposed a gaping a hole extending above the waterline. The High Speed Transport U.S.S Stringham (APD-6) rescued the 31 survivors about 10 hrs. after the attack, Captain Raymond Zalnick of the Papoose reported that the vessel may be salvaged and should be investigated by a recovery tug. The recovery tug Kewaydin (AT-24) was sent to retrieve her, however upon arrival it was declared the Papoose could not be saved and she sank the following day. The Papoose was sunk by the Type IXB (class) U-boat, this submarine had a range of 1,500 nautical miles, producing 4400 hp while cruising 18 kts. on the surface. Its weapons capabilities included (22) torpedoes, (1) 3" deck gun with 110 rounds, as well as the ability to lay mines. The IXB U-boats were the most effective of the fleet at sinking Allied vessels, Type IXB submarines were recognized for sinking on average a total of 100,000 gross tons of Allied shipping per U-boat. At 04.31 hours on 19 Mar, 1942, the unescorted and unarmed Papoose (Master Raymond Zalnick) was torpedoed by U-124 about 15 miles southwest of Cape Lookout, while steaming a zigzag course at 11 knots in moderately rough seas. One torpedo struck on the port side at the break of the poop and entered the fuel bunker, causing the flooding of the engine room and fireroom. The engines stopped immediatel y and two crew members on watch below were killed. The first lifeboat was launched after five minutes and was barely missed by a second torpedo at 04.44 hours, which struck on the starboard side just aft of amidships. The explosion opened a large hole near the waterline that extended eight feet above the water, causing the ship to sink a few hours later. A second lifeboat was launched five minu tes after the second hit. The surviving eight officers and 24 crewmen were picked up by USS Stringham (DD 83) about ten hours after the attack and taken to Norfolk, Virginia.